PopCap's word-loving worm embarks on an epic quest to save an oracle named Cassandra in Bookworm Adventures. As in earlier games, players are challenged to build words by selecting letter tiles positioned on a grid. Unlike previous titles, letters do not have to be connected to one another. Bookworm Adventures features yet another twist: the design is closer to a role-playing game than a traditional action puzzle title. Each word formed on the 4x4 grid is used as an "attack" against more than 150 mythological monsters. One-on-one battles take place from a side-view perspective within the screen's top half as each side trades health-depleting blows. The larger the word, the more damage is dealt. Players will also gain experience over time, allowing Lex the Bookworm to receive more health or other attribute-enhancing powers. Players can even acquire helpful items and potions to use in battle. 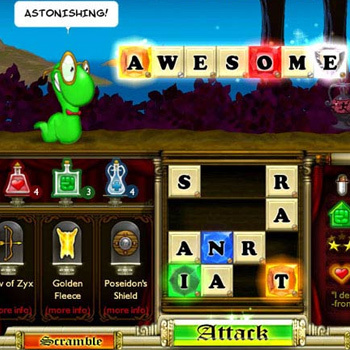 In addition to the main Adventure mode, Bookworm Adventures includes a monster-battling Arena mode and three word-oriented mini-games.